make em gone please, I am tired of seeing these sit in various places of my house's yeah yeah I said plural. they moved to my second house that my soon to be ex is keeping and back down the hill to our old house. 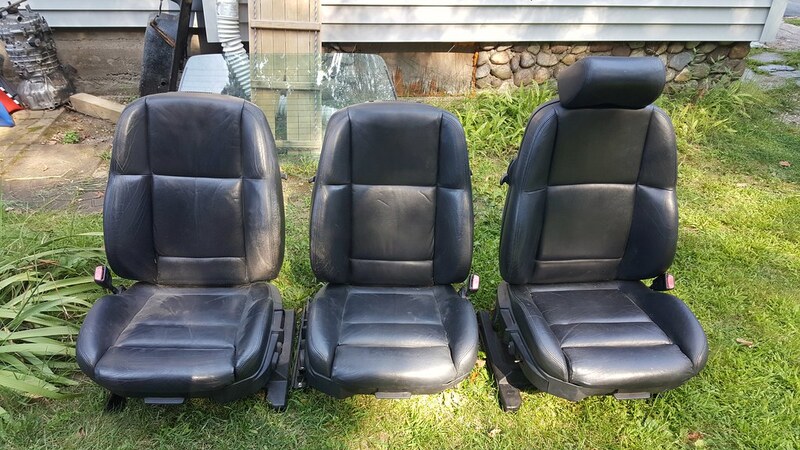 Western Mass, if you need some seats come get before I decide to install them in my Ti as it has vinyl and I planned to put SRD's in it vs the oem seats. I have a bottom of the rear as well. Someone is going to say it ? Is 50 bucks cheap enough for someone to come get these? They have till October 1st and then they are headed to scrap yard. I can't horde like this anymore. Last edited by E30-M3; 09-04-2017 at 11:43 PM. damn. too bad i'm in CA. i need new seats. I will have them till fall then they are gone. Oct 15 in my book. Are you willing to palletize & stretch wrap them? I can have a semi pick them up with a liftgate. PM me with a guesstimate on total weight including pallet and your zip code so I can get a quote. I could go one better, I'd be willing to take them to fastenal or yellow or ODL and drop off at their local hub and ship them. ODL might work, I think we have rates set up. Let me check. In the meantime, let me know your thoughts on the weight and your zip code so I can run some numbers. I work in Chicopee which is 01013 and s next to Springfield which our area has a bunch of LTL carriers. It's going to be too much to ship. I'm hoping someone local can grab these up. Ok, heck if they were manual I would have installed them in my new car. I like the simplicity of the manual seat. These wouldn't be available still? I actually live in mass.